I've been creating art (visual art, music and written works) in a professional sense for more than 20 years at this point. While I've had dry spells at times (or had life events that required me to pull back on my art immersion), I've always chipped away at my artistic practice. I started more as a visual artist, before I owned a guitar, but I always associated music (if only in my head at those times) with the visuals I created. As I finally got my hands on a guitar my creativity expanded. I erupted with a creative explosion, prolifically writing songs and creating art inspired by the stories of emotions of those songs. Writing was always a backbone of both my visual and musical outlets as I believed (and still believe) that it's important for an artist to write well if for no other reason than to articulate his/her artistic vision and intentions to others. College is when I honed in on purposely expanding my creative horizons by further developing my writing abilities. In a societal and cultural sense (at least in the western world) there is a pressure to focus on, and get good at, one thing to forge your career. For me, I've always struggled mentally with this idea because I'm interested in constantly meddling in multiple art forms as each provides me different forms of inspiration to keep me creating. In fact, I feel most comfortable when I can develop a project that incorporates all of my main creative outlets -- music, art and writing. At times, over the years, I've held myself back by succumbing to the pressure of needing to focus on one art form. At first, I felt liberation -- I wanted the simplicity of only having to focus on one art form. I thought I could truly develop a distinct style and define my creative self if I only concentrate on one thing. However, after a little while it just drove me nuts. That's just not me. I need a more holistic approach. So in a pursuit over the years for my own style in one art form and/or genre I've realized my style is to be interdisciplinary in my approach to my creative output. Doing so has led to more success in my career -- my own personal creative career as well as the work I'm paid to create for businesses I work with (past and present). How about you? Let me know here. The next progress update regarding the journey toward fulfilling my 2017 goals, is now available. Read the update in its entirety here. Last month I published a post that encouraged professionals and business owners to put a dollar value on their time. I conducted a small survey with a handful of responses (certainly not scientific here), but it was interesting to read how much other professionals deem their time to be worth. I averaged the survey results up and out of its respondents the average professional believes their time is worth $262.50 per hour. So why was I interested in this? Personally, I freelance my skills and time as a contractor on many occasions, and it's always interesting to me the responses I get when I share how much I charge for my time, services and the overall value to the client of the service I provide. Just to be clear, often the response is negative...as in, I can't believe you are charging that (and trust me, my rates are average to low for the services I provide if said potential client went to a full-blown marketing agency). ...and that's probably the bigger lesson here: if potential clients are not willing to pay you the price you've set forth you're either marketing to the wrong people, or you haven't justified your value to them and their business...or both. The survey from last month was another way for me to validate to myself, and to prospective clients, why I might charge what I charge on an hourly basis (if the project is something where I am in fact charging for my time). The thought process was, if I could gather survey responses from a good cross-section of my target audience and identified among them how much (at least on average) they believe an hour of their time is worth, then I could align my hourly rate with a similar prospective client and further justify why I should be paid my price (again, you do absolutely have to be able to also present your value here). So, on average those in my target audience are suggesting their time is worth $262.50 per hour. If I presented an hourly rate that is more than a 50% off of their hourly rate (i.e. $130/hr. ), wouldn't they be coming out ahead saving time and money? What's to complain about in that price or approach? Guest post - About the Author: With over 25 years of experience in sales and marketing, Brad Shorr is Director of Content Strategy at Straight North, an Internet marketing company in Chicago. He has been featured in many top online publications including Moz, American Marketing Association and Forbes. Lead generation marketing campaigns are complex, which is why many organizations get sticker shock when they hear how expensive SEO, PPC and other forms of marketing are. 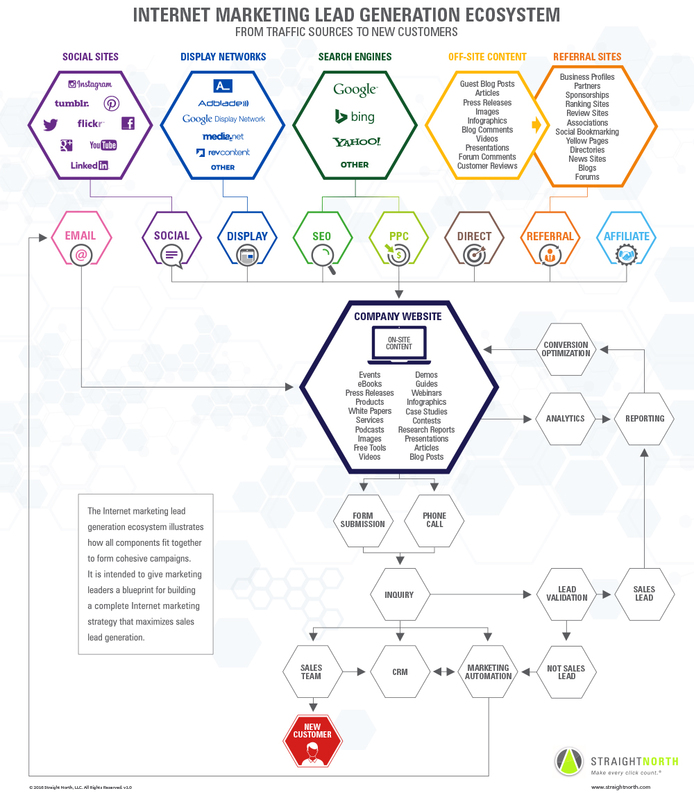 The infographic below, the Lead Generation Ecosystem, is designed to give organizations a clear picture of what a lead generation campaign should look like, and why it is no easy task to get each piece in the right position. The infographic was developed by Straight North, a PPC management service provider headquartered in Chicago. It was first created as an internal training tool for new hires, and proved so effective that the agency has made it available to the public. The largest image in the infographic is the company website, since that is where online traffic is converted into sales leads. A good topic for reflection: Are you taking advantage of all the possible types of content on your website? Because of cost, production difficulty, lack of talent and other issues, many businesses rely far too heavily on text-only or text-heavy content. This practice is costly in terms of conversion. Today’s website visitor probably prefers visual content, whether it be short video, infographics, slide presentation or high-resolution, custom photography. Without these, visitors are liable to enter and leave your website without consuming much content, if any. Lead lost! I'll be writing brief goal updates on my Patreon page for anyone to follow along my journey this year. Here's the latest Progress Update. Feel free to follow along, and if you're so inclined , become a patron, however, don't feel obligated. I appreciate your attention and support. I don’t believe in New Year’s resolutions. Typically people make resolutions too broad in scope, which allows them an easy out if they choose not to fulfill it. My opinion: goals are good, resolutions are not. For me, this year, I have creative project goals, and my measure of success will be how much, and/or how many, of them I’m able to complete. This year, I want to push past the creative barriers I’ve had in the past to do fun, interesting projects and figure out the monetization along the way or after the fact (that’s in part where you can help and be a part of the projects on Patreon — regardless if you become a patron, be sure to follow along to see the progress). Personally, I always enjoy reading, experiencing, watching hearing about a creative person’s journey through their projects almost more than the end result of what they produce. I’m always curious about the path they took to get there. To me, that’s fascinating. In observing others’ path towards their goals, I feel like I learn alternative ways to approach the creative process, which in turn helps my own creative process. That’s, in part, what I hope you gain from following along with me this year. My creative journey, as well as any, is translatable to other fields and industries. Understanding how to work through projects or processes for your job or for your business is a creative process whether or not you consider yourself a creative person. 1. Flesh out and re-master the audio quality of my Light of Mourning music album. 2. I’m currently getting clear on a (film/audio) project I’m calling the Legacy Music Project (a working title for now). 3. Begin to seriously work on my creative story/comic called Boxville. 4. I will continue to work on my AutismHR.com project, which is designed to help adults on the autism spectrum embrace the gig economy to earn an income on their terms from their skills. 5. Finally, I will continue to increase my knowledge and creative usefulness in my day job, continue to offer freelancing creative services and music performances, however, I want to help more of my contacts build their careers and build their businesses by helping facilitate useful connections to help grow their endeavors toward success.